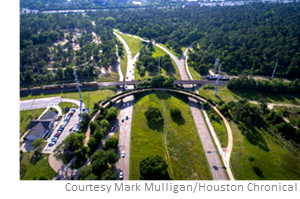 ​ HOUSTON – The Kinder Foundation has made a $70 million contribution to the transformation of 1,503-acre Memorial Park, which is expected to take about 20 years to complete. The project includes a land bridge, an indoor pool, increases to bike and running trails, an observation deck, and a remodeled golf course driving range. The first phase of the master plan began in December 2015 with the groundbreaking of the 113-acre Eastern Glades portion. The project would potentially cost more than $200 million over the next two decades.